In my previous post, I gave you a photo tour of the Center Gai area of Shibuya. In this post I’ll be going through all the other shopping and stores I saw in Shibuya. Many American and European brands are popular in Tokyo. It is not uncommon to see many people with Louis Vuitton handbags or other designer clothing. Other brands like Apple and Disney have prominent locations in Shibuya. While no one was lined up outside on that particular day, this is the most popular Apple store in Tokyo. The Disney Store had quite impressive architecture and looked just like one would in America. The building right next to the Disney store was a movie theater called HUMAX Pavillion. Even though I didn’t know what many of the buildings and stores were in this area, I love the look of buildings in Japan. There are many Japanese fashion stores in Shibuya such as this one, OICITY. Tower Records was one of the few stores I went in to look around. On my next trip to Japan I’d like to do more shopping and looking around inside stores, but since there was so much to see, I preferred to just walk around and look from outside. Also, I knew I wouldn’t buy anything anyway. I went into Tower Records though because I was curious what kind of music selection they would have compared to stores in America. The store was 9 floors and bigger than any music store I had ever been in before. The first floor was occupied by Japanese music, of which only a few artists I recognized, but in some of the upper floors there was more I was familiar with. These days I buy almost all my music online because I find stores like FYE and Best Buy have a pitiful music selection. Tower Records had better selections of stuff like Eric Clapton, Pink Floyd, and other classic rock musicians than any store I had ever been in. While I’m sure the equivalent store in New York and other big cities in America have good selections too, I still found it funny that I was seeing a better selection of music in Japan than in any store I had been to in America. My first authentic Sushi experience was at this sushi restaurant where you stand around the bar and order directly from the sushi chef. They advertised English menus, which is what drew me in, as I was still a little intimidated by the possibility of going to a restaurant that had no menus either in English, or with pictures. Above was my meal, minus one piece which I already ate. They also served miso soup. While it wasn’t really a “taste the difference” kind of experience when comparing the sushi I have had in America, it is easy to tell when sushi served in America is like what you’d get in Japan or not. PROTIP: California rolls are not authentic. Plastic food is a huge industry in Japan, and not something you’ll really find in the US. Most restaurants have pictures of their food in the windows or on a sign outside, but many even have plastic replicas of the food on display so you can see what it looks like before deciding to eat there. It especially comes in handy for foreigners. My home base is in Chicago, so I loved seeing this Sweet Home Chicago advertising at in a clothing store window. Eventually I wandered out of the shopping district and into the business area. I didn’t spend long in this area but still took some photos. 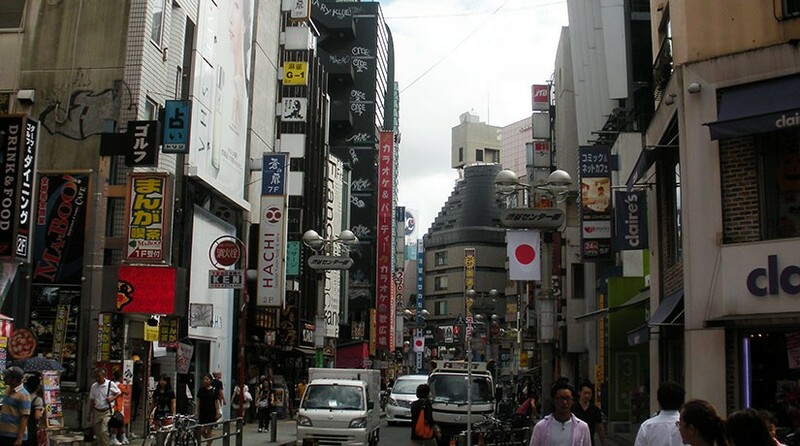 “Love hotels” can be found in Japan and the most popular place for them is this area in Shibuya with many hotels, commonly referred to as “love hotel hill”. One thing I definitely plan to do on my next trip to Japan is participate in more nightlife. I didn’t go anywhere on this trip for a couple reasons. One was because I was alone and was unsure about going to Japanese clubs as a foreigners by myself. The other reason was just because I was so tired in the evenings after trekking around Tokyo all day. Club Asia is one of the most popular clubs in Shibuya and definitely somewhere I want to check out in the future. For some reason there were girls waiting outside the club area even though it was the middle of the day. I’m not sure what that was about. The Hachiko Shibuya bus, named after the same dog the Hachiko statue is modeled after. It made me wonder if there was a cat bus! That’s it for now. Check back soon for more from Shibuya, and my trip to Kyoto! No spam ever, just great stuff. I'm Jeff, a writer and world traveler. Learn more about me and why I started this blog. © 2015 Jeff Moeller. All Rights Reserved.